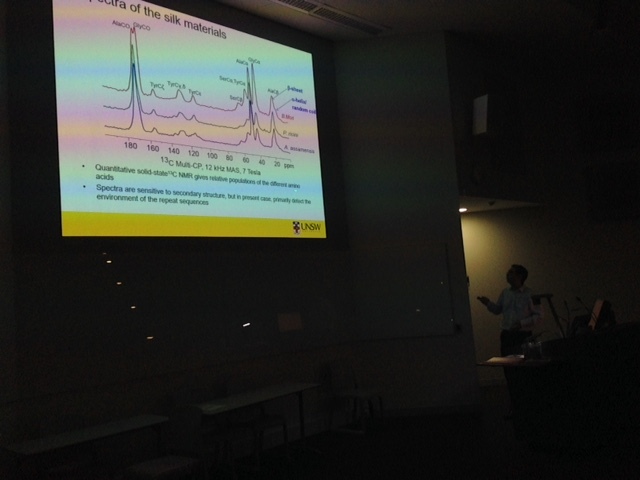 On November 9 2018, Aditya Rawal presented our collaborative silkworm silk NMR, FTIR, AFM and TEM results at the 8th Western Sydney University NMR, MRI and Diffusion Workshop at WSU, Campbelltown. The talk covered the material properties of native and reconstituted silks, amino acid sequences and how examine structures using NMR, FTIR, XRD etc. 1 and 2D NMR outputs were presented and their interpretations against other methods and other studies, and the causes of variation between them. A reason for variation seems to be measuring local properties but interpreting them as bulk properties. The AFM and TEM showed local structure variations and why these interpretations can be erroneous. It was a great talk.